I admit it. I don't drink enough water. At the most, I will drink maybe four or five glasses of water a day which includes a cup of coffee or tea. When I was working, I tend not to drink enough. For one, I don't feel thirsty because the centralized air conditioning system was very cold. On cloudy days, I felt like I was sitting in a big freezer and my fingers will be to numb to type on the keyboard. Secondly, the ladies room was situated at the far end of the building. For me to do a 100 meter dash in my high heels each time nature calls will not look good when there are customers present. That is why I used to suffer from constipation. We are made up of 70% water. 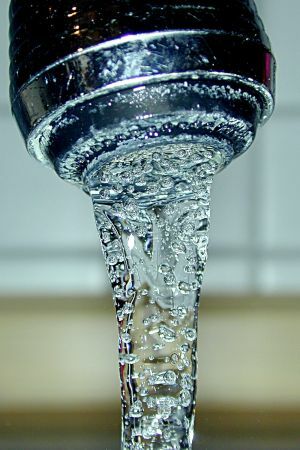 Without water, our organs will stop functioning and the body will die. The fact is, we can survive without food longer than if we go without water. And yet, to drink more water is the most simplest, free and easy way to stay healthy or improve your health and productivity. You get more done which does not have to involve planning, going to the gym or follow a crash diet. Instead, we complicate it or just simply forget to drink water. We need to drink enough water to maintain a healthy internal balance. Most of us know that we should drink more water but do you know the reasons why? Here are some side effects of not drinking enough water. When your body is dehydrated, each cell gets dehydrated as well and your body cannot fully function. 1. You feel fatigue or tired. 2. It can also make you feel lethargic. 3. You suffer from frequent headaches. All the above conditions will have a direct impact on your energy level and performance. Try drinking more water throughout the day will prevent headaches from occurring. Mental alertness will also be affected. Therefore stay hydrated and you will find that you are able to focus better and get more work done. 1. By drinking sufficient water helps to flush toxins and waste products from our bodies. 2.Water also aids our digestion and balances the internal system. 3. It may also help reduce the risks of heart attacks and cancers. You will feel happier and healthier when you drink enough water because your body is hydrated and your internal metabolic systems and process are optimized. Our body requires water to digest the food that we consume and for unwanted fats to be eliminated more efficiently. Water can reduce our urge to overeat and quenches our thirst which sometimes can be confused with hunger. When our cells are well hydrated, our skin will remain supple and smooth. Water actually helps to prevent premature aging. Drink more water and it will save you a bundle of money that you would otherwise spend on expensive anti-aging creams, Botox injections or serums. When we are busy with work, children or activities, we may forget to drink water. Here are some tips on how to remind yourself to drink more water every day. When you set a goal, be specific and write down the benefits. In doing so, you have a clear purpose that will keep you motivated to hit reach your target. Over time, to drink more water will become natural and be part of your daily routine. As a general rule, we require 8 glasses of water per day or equivalent to 2 liters. However, if you have a medical condition, you should seek advise from your doctor to find out how much water you should be drinking. Put reminders into your phone or desk calender to drink at regular intervals. However, do not try to drink too much at one go. Small sips regularly is much better than infrequent big gulps. A lot of people do not like plain tasteless water. Zest it up with a slice of lemon or other citrus fruit will make drinking water more pleasant. Keep a chart near your work station to track if you are drinking 8 glasses of water a day. Tick off each time you drink a glass. Sounds juvenile but this will ensure your intake is consistent every day. Maintain the chart for at least 1 month. You will find that drinking water will eventually become part of your daily routine. Fill up the bottle when you reach the office in the morning. By slowly drinking all the water from the bottle throughout the day will also ensure you are taking the correct amount of water daily. Follow any one of these 5 simple steps will help you attain a healthy and productive you! My next topic for discussion is, "How to beat the Monday Blues?" 43) HOW TO KNOW YOUR FACE SHAPE. A pen art I did in 2011. How many sea creatures can you find? Thanks for looking and taking the time to read my blog. I welcome feedback and please feel free to share your experience in relation to this topic.